A.J. had her confirmation last May. Our gift was : we are going to pay half the price of the motorbike she is going to buy. 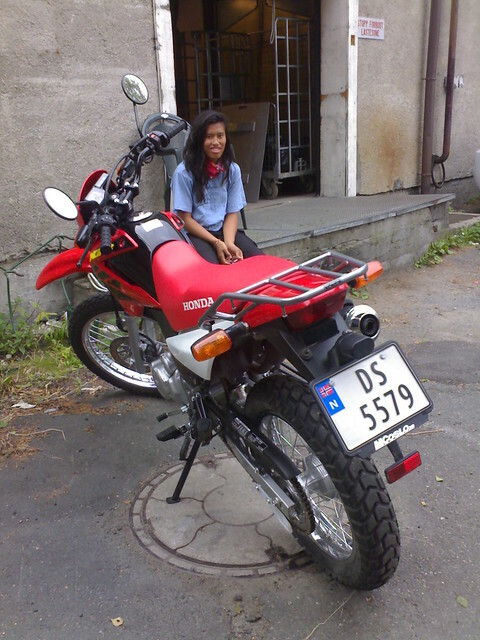 She found the bike that she liked Honda XR125. We ended up paying 2/3 of the price. Ugh. Talk about being broke. We promised her that if she doesn’t smoke, we would pay for her driver’s license too. My husband even gave her a cigarette! She still has it in her room. So… there goes 550 kroner per hour! In Norway, a 15 year old can practice driving a 125cc motorbike and could acquire the license to drive it when they are 16. A lot of people told me that I should not let her drive a bike. It is dangerous. I agree with my husband, John, when he said that it is more dangerous to let the kids drive a 50cc (moped). The first time I went here (4 years ago) at Lysgårdsbakken, my husband John told me that he didn’t like to take the lift because he has done it before. I looked down and saw that I can handle it since it is just 5 meters down. Little did I know that it was a long way down from the lift! I have a problem with heights (and so has my husband). He tricked me into taking the lift!!! This time, I did not take it.